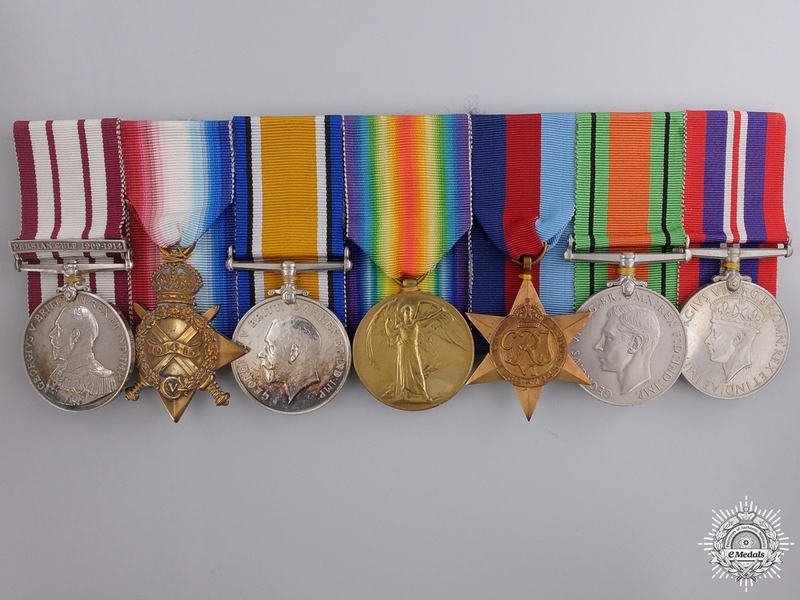 A First & Second War Group of Seven Awards to Lieutenant Darbin of the Royal Navy - Naval General Service Medal, 1 Clasp - PERSIAN GULF 1909-1914, George V (234285. F.W. DARBIN, A.B., H.M.S. ODIN. ); 1914-15 Star (234285. F.W. DARBIN, P.O., R.N. ); British War Medal (GNR. F.W. DARBIN. R.N. ); Victory Medal (GNR. F.W. DARBIN. R.N. ); 1939-1945 Star; Defence Medal; and War Medal 1939-1945. 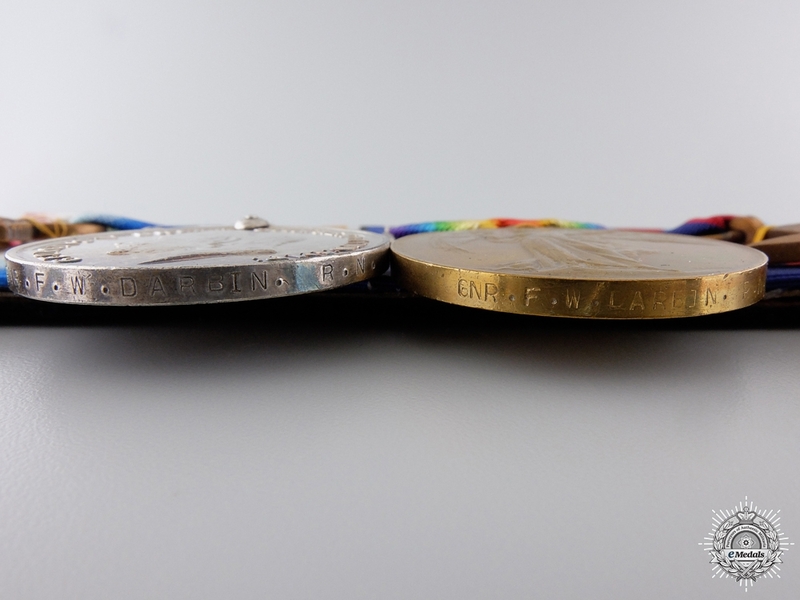 Naming is officially impressed on the NGSM and the First World War Trio, the Second World War medals are un-named. 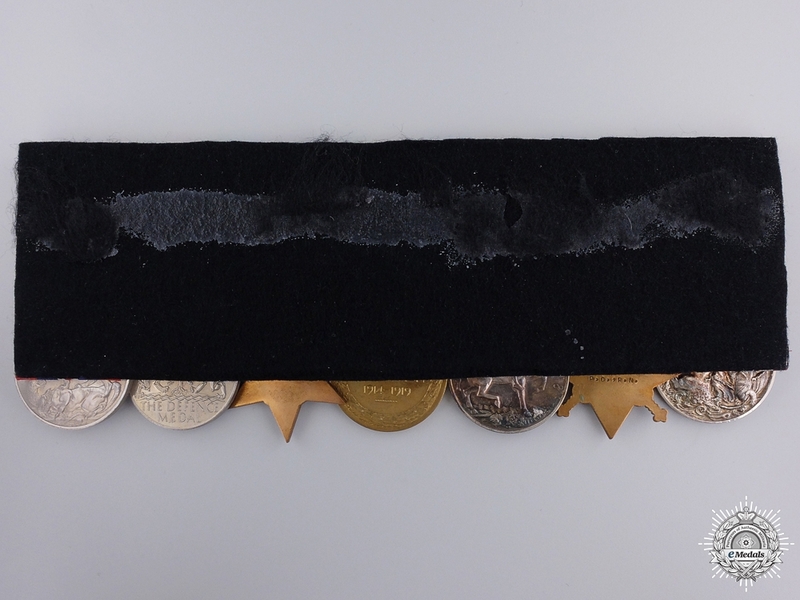 Court mounted, edge nicks on the NGSM, near extremely fine. Accompanied by a duotang folder with his military biography and eleven black and white ship photographs. 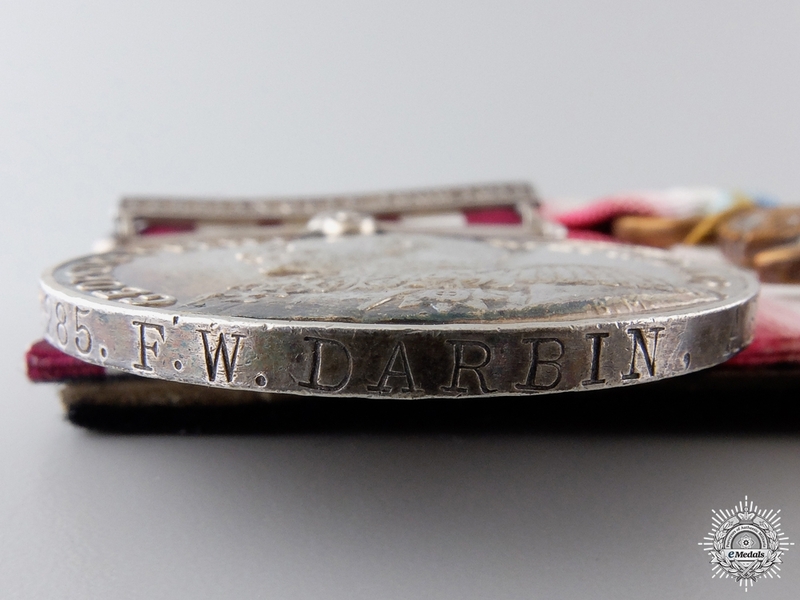 Footnote: Frederick William Darbin was born on March 5, 1889 and was an Able Seaman in the Royal Navy in 1909. He was aboard the Sloop H.M.S. Odin in the Persian Gulf and the Pacific, between October 1909 and August 1914, guarding against pirates and gun-runners, earning him the Naval General Service Medal with Persian Gulf 1909-1914 Clasp, and became a Petty Officer in 1914. During the First World War, he is surmised to have still been on the Odin, likely in the East Indies. Upon his promotion to Gunner on September 25, 1918, he was posted to the Torpedo Boat H.M.S. 034 on October 7th and saw service in the English Channel with the Portsmouth Light Defence Flotilla. In the inter-war years, his service extended to a number of postings, the first of which was to the Depot Ship H.M.S. Hecla at Chatham, on January 31, 1920. Eight months later, he was assigned to the Cruiser H.M.S. Vindictive for D.F. & I. duties on October 8th. After two years with Vindictive, he was posted for one year to H.M.S. Ganges, the Training Establishment at Chatham, on September 1, 1922, before being assigned to the Battleship H.M.S. Iron Duke, as part of the 3rd Battleship Squadron in the Mediterranean for "Instructional Duties", on October 20, 1923. After almost three years with Iron Duke, he was transferred to the Tug H.M.S. St. Fagan, 2nd I.C. and tender to H.M.S. Excellent at Portsmouth, on August 30, 1926 and it was with St. Fagan that he saw his promotion to Commissioned Gunner on June 13, 1928. Near the end of 1928, he was assigned to the Aircraft Carrier H.M.S. Argus, as part of the Atlantic Fleet, on November 9, 1928. After having served twenty months with Argus, he was posted for one year to H.M.S. Pembroke, for Duties with the Royal Indian Marine Ship Hindustan, a Minesweeping Sloop, on July 1, 1930, before being assigned to the Cruiser H.M.S. Durban, for three years' service in America and the West Indies Station, on June 30, 1931. He followed his service with Durban with a posting to the Minesweeper H.M.S. Alresford, tender to H.M.S. Dryad, the Royal Navy Navigation School at Portsmouth, on May 22, 1934 for two years, followed by a transfer to the Monitor H.M.S. Erubus at Portsmouth, tender to H.M.S. Excellent, on June 22, 1936. In the new year, he was posted to H.M.S. Victory, the Royal Naval Barracks at Portsmouth, on January 2, 1937, where he would serve for the next thirteen months, before being placed with the Cruiser H.M.S. Danae "in reserve", on February 1, 1938. Darbin retired in June 1939, and is on record as being a Lieutenant (Retired) as of 1940. In the early years of the Second World War, he continued to be on the retired list, but was recalled to active service in 1941 and spent the rest of the war years at H.M.S. Excellent, the Royal Navy Gunnery School at Portsmouth. He was released from service at the close of the war in 1945. Darbin died at Saint Mary's Hospital in Portsmouth, on April 22, 1963, at the age of 74.